This book presents a complete translation of Bhanudatta's Rasamanjari The text is illustrated with 80 paintings of the Basoli and Nurpur Schools, which are characterized by vibrant colours and passionate expression. Dr. M.S. Randhawa was Advisor to the Planning Commission from 1960 to 1964. As a Special Secretary to the Ministry of Food and Agriculture, Government of India, he piloted the schemes of intensive agriculture, which resulted in the Green Revolution. As Chief Commissioner of the Union Territory of Chandigarh he founded the Art Museum. His last official assignment was as Vice-Chancellor of the Punjab Agricultural university in Asia. He is an authority on Pahari Painting and has a number of books on this subject to his credit. 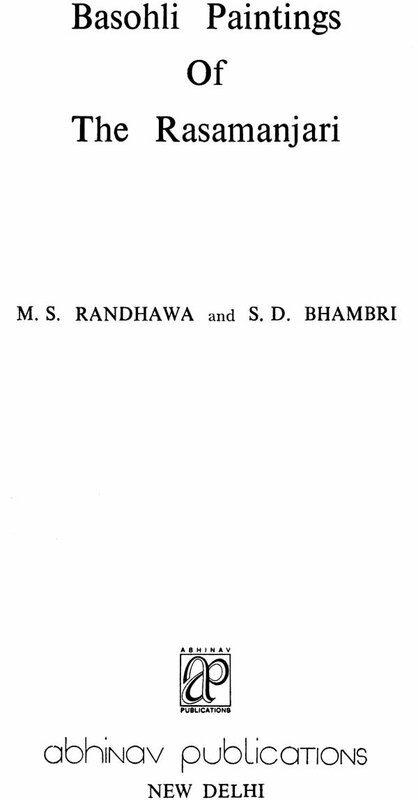 His co-author, Shri S.D. Bhambri, is a senior I.A.S. officer who is at present Chief Secretary to the Haryana Government. He is a renowned scholar who has command over English as well as Sanskrit. Apart from the Rasamanjari, he has also translated the Rasikapriya of Keshav Das. 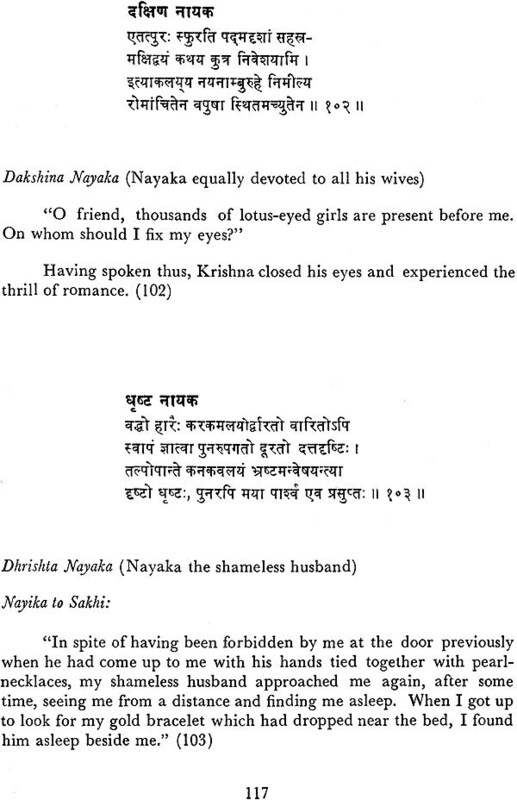 Shringara literature in Sanskrit and Hindi classics has a unique place in world literature. Shringara refers to love as represented in literature. 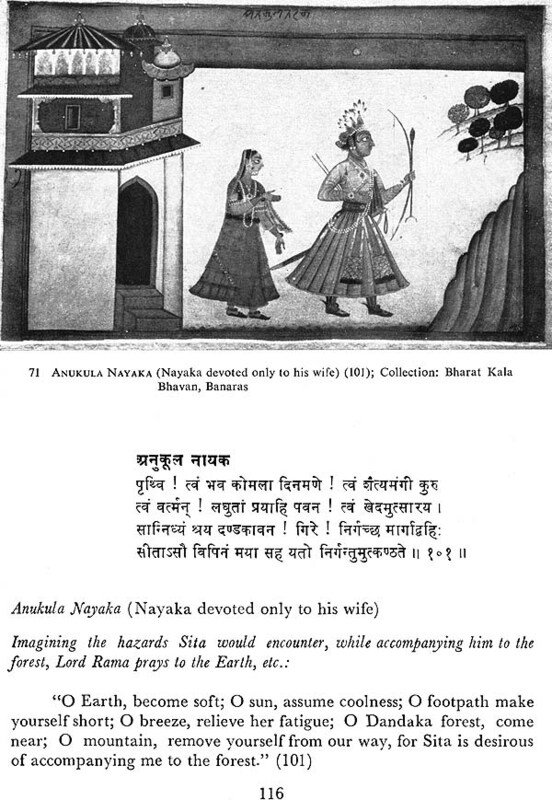 Nayaka is the hero or lover. Nayika is the heroine or woman who is loved. Nayikas are classified according to their age or experience, their physique and talent. Shringara literature has its roots in Bharata’s Natyashastra, a treatise on dramaturgy, which dates back to 100 B.G. to second century A.D. It deals with the doctrine of rasa or flavour, and bhavas or emotions. Then follows a subtle classification of women, according to mood, sentiment and situation called Nayika-bheda. The eight-fold classification of heroines is given, and female messengers, their qualities and functions are described. 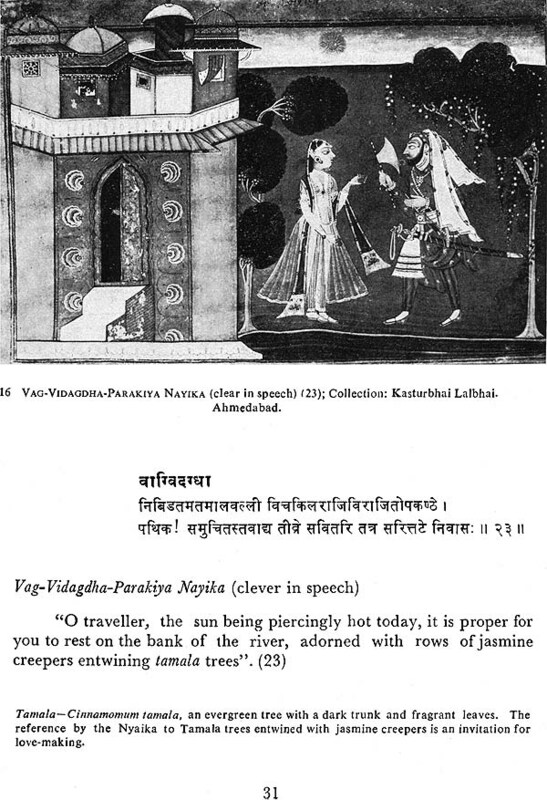 Jayadeva, the court poet of Lakshmanasena (A.D. 1179-1205), wrote the Sanskrit poem, the Gita Govinda, in which he described the love of Radha and Krishna in all its stages. Here Radha is the Nayika, and Krishna is the Nayaka. Eastern India became an important centre of Radha and Krishna cult in the fifteenth century. Vidyapati (fl A.D. 1400-1470) the poet of Bihar wrote in the sweet Maithili dialect on the loves of Radha and Krishna. A contemporary of Vidyapati was Chandi Das (fl A.D. 1420) who lived at Nannura in Birbhum district of West Bengal. In his Krishna Kirtana, Chandi Das describes the love of Radha and Krishna in different phases. 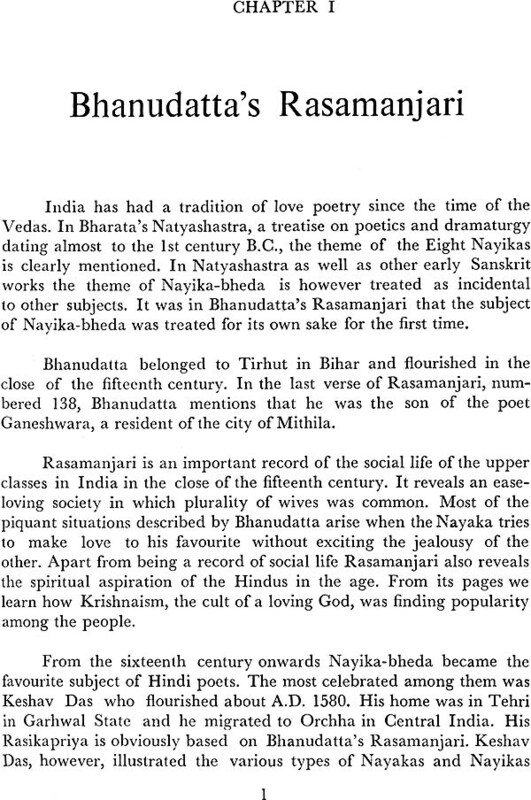 Following the same tradition Bhanudatta, who belonged to Tirhut in Bihar, wrote his Rasamanjari, or Bouquet of Delight, in the fifteenth century. In Rasamanjari, the subject of Nayika-bheda is treated for its own sake for the first time in Indian literature. 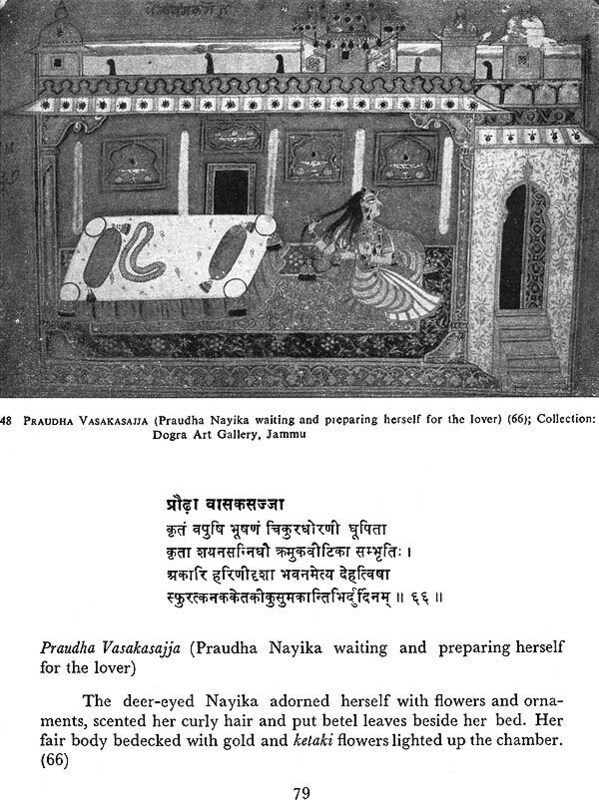 Rasamanjari has a unique place in Sanskrit love poetry. 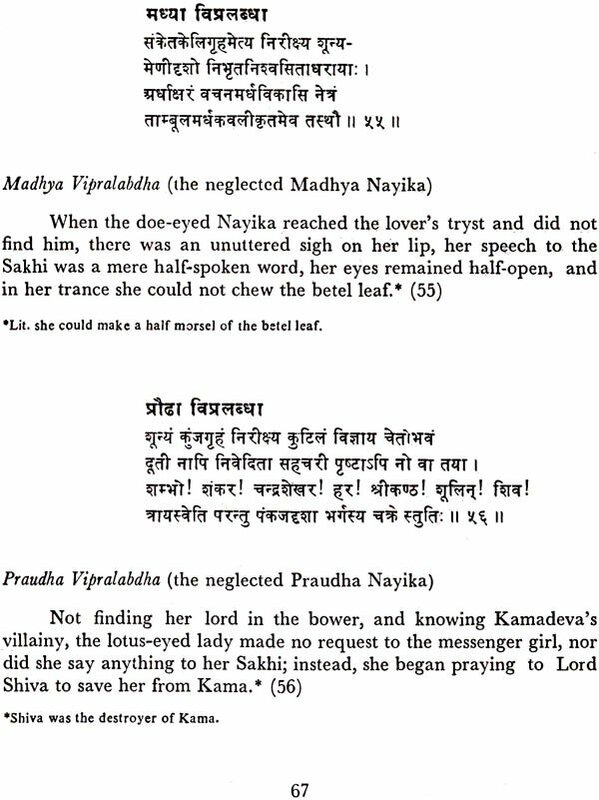 In the close of the sixteenth century, it provided the base for the Rasikapriya of the Hindi poet, Keshav Das of Orchha, which contains a more elaborate classification of Nayikas and Nayakas, and their moods and feelings. It is surprising how the Rasamanjari did not attract the attention of the British orientalists, who assiduously translated so many Sanskrit classics. It is the studies of Indian miniature paintings and their texts, which drew the attention of scholars to this delightful poem in the current century. 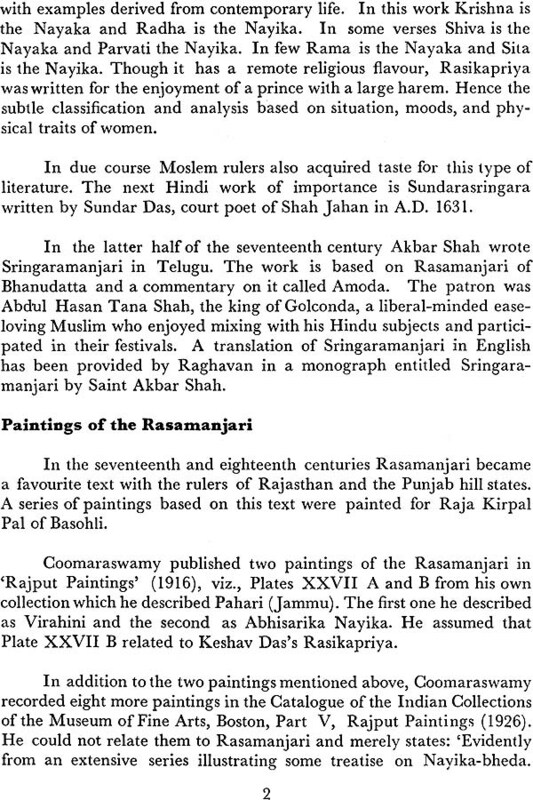 The pioneer of studies in Indian miniature paintings, Dr Ananda K. Coomaraswamy, recorded eight paintings of the Rasamanjari in Basohli style (or Jammu, as he called it) in 1926. However, he could not relate them to the Rasamanjari. Hirananda Shastri in 1936 read the colophon of series of paintings and discovered that the text of these paintings relates to Bhanudatta’s Rasamanjari. As a translation of the Rasamanjari in English was not available, scholars of Indian miniature paintings gave imaginary interpretation of the scenes shown in the paintings. 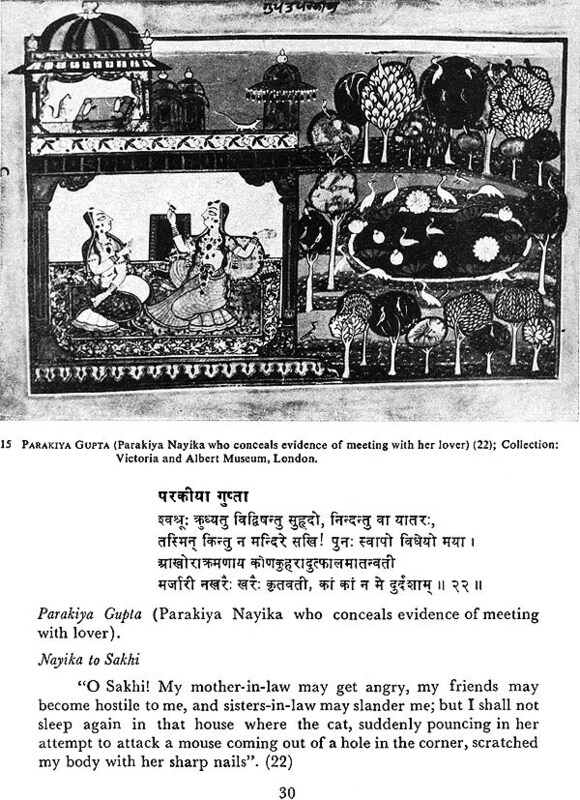 In a painting, a cat and a rat are shown on roof-top below which the Nayika is sitting along with her Sakhi. The cat was interpreted as Krishna, chasing the rat, who was Radha. It is for the first time, a complete translation of the Rasamanjari has been provided, and it leaves no room for fanciful interpretation of animals or human beings depicted in paintings. The Rasamanjari is a long poem. It is only for convenience of the reader that the text has been split up into nineteen chapters. In this book we relate 87 paintings to the text. Collection of photographs of paintings which were scattered in collections of private collectors and museums was an arduous task. We are grateful to late Dr W.G. Archer, Keeper Emeritus, Victoria & Albert Museum, London, and the Keeper, Indian Section, Museum of Fine Arts, Boston, for providing photographs of the Rasamanjari paintings in their collections. 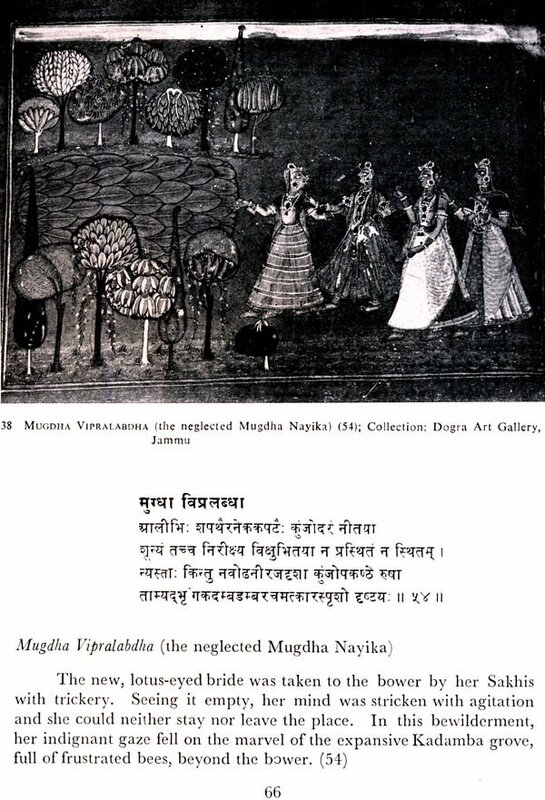 We also acknowledge the help given by the Curator, Dogra Art Gallery, Jammu; Partap Museum, Srinagar; Chandigarh Museum; National Museum, New Delhi; Bharat Kala Bhavan, Banaras; Seth Kasturbhai Lalbhai, Ahmedabad; and Professor J.K. Galbraith in allowing the reproduction of photographs of paintings of the Rasamanjari in their collections. We further record our gratitude to Mr. F.S. Aijazuddin for providing photographs of the paintings of the Rasamanjari in the collection of Lahore Museum and Pakistan Museum, Karachi. The Bouquet of Delight of Bhanudatta illustrated with delightful paintings in Basohli and Nurpur styles of Pahari paintings will provide joy to many persons who will savour the sensuous beauty of Bhanudatta’s poem and its rendering in painting by the artists of the Punjab Hill States.